Posted on October 11, 2018 by FRIENDS | Comments Off on FRIENDS in the News! Click HERE or on the image above to view the clip from NBC New York Channel 4 News. This past Tuesday, FRIENDS’ Executive Director Rachel Levy was interviewed along with longtime zoning consultant George Janes about the impending development at 249 East 62nd Street. The proposed Rafael Viñoly designed tower– which has been referred to as “Jetsons-esque“– includes a 150-foot height-boosting void in its core, meant to lift residential units higher into the sky. In the interview, she explains that the proposed design deviates from the “relatively predictable forms” produced by tower-on-base zoning “seen up and down our (Upper East Side) avenues.” This void is an example of a notorious zoning loophole now so frequently abused by developers wishing to reap profits from artificially boosted apartments, at the expense of New Yorkers living in residential neighborhoods. 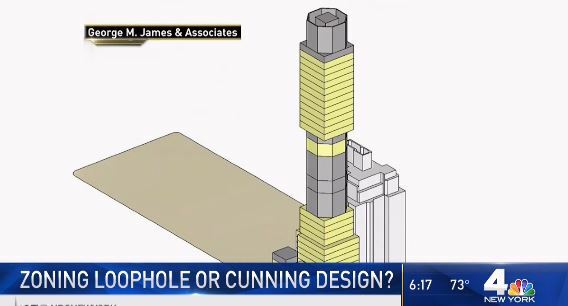 FRIENDS of the Upper East Side has filed a Community Appeal to challenge the DOB’s insistence that this tower does not violate New York City’s Zoning Resolution. Manhattan Borough President Gale Brewer, City Council Speaker Corey Johnson, and the Manhattan Delegation of the City Council have also called for the City Planning Commission to seek immediate solutions for these zoning loopholes that threaten livability of our city’s residential neighborhoods in a joint letter which can be found HERE. For updates on the appeal and for more information on this development, please visit our website HERE. Comments Off on FRIENDS in the News! 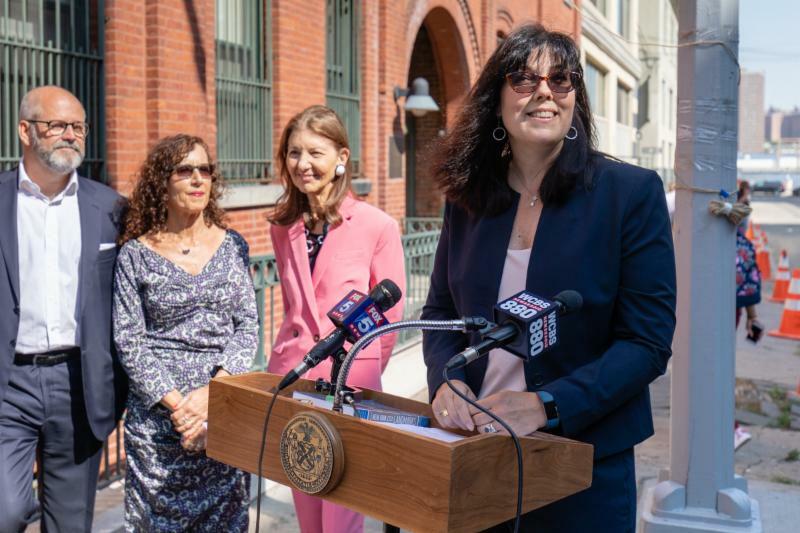 Last week, Mayor Bill de Blasio nominated Sarah Carroll as the new Chair of the Landmarks Preservation Commission (LPC), a position that has been vacant since June. Ms. Carroll has served as the Executive Director of the LPC since 2014, and she has been at the agency for 24 years, including serving as LPC’s Director of Preservation from 2005 until 2014. She holds an MFA in Historic Preservation from Savannah College of Art and Design. At a City Council confirmation hearing last week, Ms. Carroll emphasized her plan to continue to increase agency transparency and outreach to both designated and un-designated neighborhoods to educate about the work of the LPC. She also spoke about promoting and maintaining productive communication with community groups, and the need to identify properties for designation early, particularly those with outstanding cultural value. This nomination was met with widespread support and Ms. Carroll’s appointment was approved unanimously at a City Council Stated Meeting this past Wednesday, September 26th. FRIENDS looks forward forward to continuing to work toward our City’s preservation together with Ms. Carroll during her tenure as LPC Chair. Join FRIENDS on November 7th for our Book Launch! Comments Off on Join FRIENDS on November 7th for our Book Launch! THIS EVENT HAS BEEN rESCHEDULED DUE TO INCLEMENT wEATHER! Who lives in Yorkville? What makes a neighborhood come to life? Join noted hospitality professional Angela Christensen for an early evening walk as we uncover what makes Yorkville tick. Cultural centers and old-world family businesses have shaped Yorkville into a diverse enclave within a residential neighborhood. We will experience the flavor and charm of this neighborhood with treats along the way including the surprising location of an Andy Warhol studio. On our stroll we pass places of interest that will include: Budapest Café, Czech Consulate, Orwashers Bakery, Schaller & Weber, Suburban Hook & Ladder Company No. 13, and the Hungarian Cultural Center. Meeting point will be provided upon registration. To verify your current membership status, please call 212-535-2526 or email us at info@friends-ues.org. You’re Invited to the 15th Annual Ambassador to the Upper East Side Award Dinner! Posted on September 4, 2018 by FRIENDS | Comments Off on You’re Invited to the 15th Annual Ambassador to the Upper East Side Award Dinner! Click HERE to purchase tickets or make a contribution. Since then, we have all benefited from Arete’s passion and trained eye. She is a scholar of decorative arts and architecture and a garden-design expert. She is co-author of Glasshouses: An Architectural History of Greenhouses, Conservatories, and Orangeries (Rizzoli International, 1988) and author of Gardening by the Book, published in 2013 to accompany the major Grolier Club exhibition she curated. There is hardly an aspect of civic life in New York that Arete hasn’t touched. Her commitment to protecting what makes New York livable is demonstrated by her leadership roles on the New York State Board for Historic Preservation, the Empire State Plaza Art Commission, the Preservation League of New York State, the Metropolitan Opera and The Garden Club of America. Arete has made the Upper East Side her home since she arrived in 1973. She still lives in the Charles A. Platt building she moved to in 1985 with her late husband William B. Warren. Arete is a firm believer in grassroots preservation and a long-time friend and supporter of the Friends of the Upper East Side Historic Districts. We are delighted to salute her with the 2018 Ambassador to the Upper East Side Award. Comments Off on You’re Invited to the 15th Annual Ambassador to the Upper East Side Award Dinner! Join FRIENDS for our Fall 2018 Events! Posted on August 29, 2018 by FRIENDS | Comments Off on Join FRIENDS for our Fall 2018 Events! As the 19th century came to a close, many exclusive Manhattan clubs moved northward to the Upper East Side within walking distance of members’ homes. This walking tour led by architectural historian Matt Postal will consider this trend through various distinguished examples, viewing grand and elegant purpose-built clubhouses that were designed by McKim Mead & White, Delano & Aldrich, and Thomas Harlan Ellett, as well as handsome residences that were converted to club use in the mid-20th century. Highlights will include the Cosmopolitan, Grolier, Knickerbocker, and Union Clubs, among others. Credit: Peter Pennoyer Architects, 151 East 78th street. Photography by Eric Piasecki. Peter Pennoyer Architects is an award-winning 50-person firm of architects, interior designers, and related professionals. Founded in 1990, PPA has been recognized as a leading design firm for its substantial and varied body of work for residential, institutional and commercial commissions across the country and abroad. On October 11th, founder and principal Peter Pennoyer will lead a behind the scenes tour of PPA’s office and studios exclusively for members of FRIENDS of the Upper East Side. Join us for a chance to explore the environment in which the PPA team creates the designs for sophisticated details and craftsmanship that strike a balance between comfort, luxury, beauty, and continuity with the past. Free for current members of FRIENDS of the Upper East Side. Prior to the massive influx of Eastern European Jews after 1880, the Lower East Side, often referred to as “Kleindeutschland” or “Little Germany”, comprised the largest German-speaking community outside of Germany. This population tragically diminished with the noted General Slocum Disaster in the East River, when over a thousand German immigrants perished on a steamship hired for a Sunday School picnic for St. Mark’s Evangelical Lutheran Church. Within a year, most of the German community had left the neighborhood – many who moved north to Yorkville, which became the “new” home of St. Mark’s Evangelical Lutheran Church. Join noted tour leader Justin Ferate to discover the remnants of the German roots of the Lower East Side including the Astor Library, the German-American Shooting Club, the Ottendorfer Library, an original Turnverein, Tompkins Square and the haunting memorial to the children who died in the General Slocum Disaster. The tour will also include a private visit to the former St. Mark’s Evangelical Lutheran Church. FRIENDS of the Upper East Side Book Launch! Free to the public. Advance registration required. The Postmodern style, the defining look of the 1980s, is not commonly associated with the architecture of the Upper East Side. However, amidst a sea of bricks, brownstone, and Beaux-Arts Classicism, glimpses of Postmodern design sensibility can be found both within the streetscape and in a number of notable interiors in the neighborhood. Buildings that were originally mocked are now respected, and even landmarked, as they are reevaluated decades later. Join Judith Gura, author of Postmodern Design Complete and Interior Landmarks: Treasures of New York for a discussion about the origins of this sometimes-controversial style, its influence on architecture, objects, interiors, and graphics, and the indelible marks it has left on the Upper East Side in particular, both inside and out. or email us at info@friends-ues.org. These programs are made possible by the New York State Council on the Arts with the support of Governor Andrew M. Cuomo and the New York State Legislature. Click to view our PAST EVENTS. Comments Off on Join FRIENDS for our Fall 2018 Events! Last week, Manhattan Borough President Gale Brewer and Council Speaker Corey Johnson wrote a letter, supported by the entire Manhattan delegation of the City Council, to Department of City Planning Chair Marisa Lago to encourage the agency to address and prevent the suite of loopholes being exploited by developers. “We are writing to follow up on some tremendous work done by our community stakeholders and advocacy groups in the effort to curb excessive, illogical development. All across our borough, developers have found numerous novel workarounds to circumvent the limitations we commonly understood to apply to them under zoning. The resulting out-of-context buildings have spurred community organizing like never before, as everyday residents have committed significant time and resources to highlighting arcane but deeply impactful issues in our zoning rules.” To read the full text of the letter, click here. They go on to acknowledge the huge need for clarity on the loophole issues like excessive void spaces, mechanical space, floor-to-floor heights, and basic principles such as the definition of a zoning lot that are all being exploited to build out-of-scale megatowers that defy predictability, do nothing to alleviate our city’s housing pressures, and flout the regulations laid out in New York City’s Zoning Resolution. FRIENDS of the Upper East Side is a leader in this battle as we continually challenge out-of-scale developments in our neighborhood that do not adhere to zoning laws, and fight for the livability of the Upper East Side and all residential neighborhoods. This letter shows that our advocacy is working! We thank Manhattan Borough President Gale Brewer and Council Speaker Corey Johnson for taking up the mantle on these pressing issues and the entire Manhattan delegation of the City Council, especially our East Side representatives Ben Kallos and Keith Powers, for their support. This progress would not occur without the continual partnership of our elected officials, colleagues across the city, and of course our supporters. With continued advocacy, education, and thoughtful collaboration with our elected officials, common sense zoning reform can be achieved now, before it’s too late. We need your support to save Marx Brothers Playground. Posted on August 21, 2018 by FRIENDS | Comments Off on We need your support to save Marx Brothers Playground. OUR PARKS ARE NOT FOR SALE. When the City agrees to give away the public’s parkland to a private developer with deep pockets, you know we’re in trouble. And when that precious open space is smack in the center of the park-starved Upper East Side and East Harlem, you know we need to fight back. Because here’s what we’re getting in exchange: a massive, 1.3 million square foot private development that will rise over 700-feet … the tallest building between the Upper East Side and Boston. Friends of the Upper East Side Historic Districts is leading the fight against this alarming taking of public land and we are asking for your help. We have filed a lawsuit to prevent the City from alienating the much-loved Marx Brothers Playground at 96th Street between First and Second Avenues, to facilitate this development. For over 70 years, this park has been the site of Little League baseball games, adult soccer matches and countless recreational uses by countless individuals and families living within a five-minute walk. By allowing this development, the City is setting a dangerous precedent that puts more than 250 playgrounds citywide at risk of being mined for their air rights. This is why three other organizations – CIVITAS, Carnegie Hill Neighbors and the Municipal Art Society of New York – have joined our lawsuit. Please make a generous donation of $100, $1,000 or more to help FRIENDS stop this attack on our public parks. Designate your contribution toward “Marx Brothers Playground” in our online portal at NY Charities, or write it in the memo of your check. Our open spaces are not a luxury; they are critical to our well-being and to the quality of life of our communities. Once the Marx Brothers Playground is “demapped” we can never get it back. Please act today to support this effort. P.S. Please designate your contribution toward “Marx Brothers Playground” in our online donation portal via NY Charities, or write it in the memo of your check payable to FRIENDS of the Upper East Side Historic Districts. Additional information about this project is available here. Comments Off on We need your support to save Marx Brothers Playground. Great News! LPC Announces Second Public Hearing for Rules Changes! Comments Off on Great News! LPC Announces Second Public Hearing for Rules Changes! This week FRIENDS, along with other New Yorkers concerned with the impact of megatowers on our city, has been advocating full force for the City to make good on its promises to enforce the misuse of zoning loopholes. The high profile development at 180 East 88th Street had its first public hearing at the Board of Standards and Appeals (BSA) yesterday to address the joint community challenge by FRIENDS and Carnegie Hill Neighbors to the Department of Buildings (DOB) approval of the carve out of a 10 foot by 22 foot portion of the property’s zoning lot in order to evade the City’s zoning requirements meant to regulate building’s height and form. 180 East 88th Street has utilized numerous other tactics, including excessive floor to ceiling heights and an unnecessary intra-building void, that undermine the predictability of development in New York, nullify zoning provisions that were designed to promote livability and thoughtful urban design, and threaten our residential neighborhoods. The session contained several hours of arguments, thoughtful consideration from BSA commissioners, including pointed questions from Chair Margery Perlmutter directed at the DOB’s rationale for the prior approval. There was also spirited public testimony in support of this community appeal, including strong comments supporting our position from Manhattan Borough President Gale Brewer and Council Member Ben Kallos. FRIENDS of the Upper East Side made it clear to the members of the Board that, should they uphold reckless tactics like those employed at 180 East 88th Street, it will set a precedent that threatens to undermine any requirement of the Zoning Resolution based on avenue or street frontage. In her statement, Executive Director Rachel Levy warned that such a decision would threaten decades-old regulations that ban sliver buildings and require tower-on-base building forms that were enacted to avoid what FRIENDS’ founding president Halina Rosenthal called the “out of control hodge-podge at eye level.” Read FRIENDS’ full statement here. The BSA will continue the public hearing this fall. We are not fighting alone! FRIENDS stood side by side at a press conferencewith colleagues and our partners in government on the steps of City Hall on Monday, July 16th to call for a comprehensive solution to zoning loopholes, like those in use at 180 East 88th Street, 200 Amsterdam Avenue, and numerous other developments citywide. We thank Council Member Ben Kallos and Manhattan Borough President Gale Brewer for their leadership on these issues, and State Senator Liz Krueger and Council Member Keith Powers for their ongoing support. We salute our partners at Carnegie Hill Neighbors, Landmark West!, the Committee for Environmentally Sound Development, East River Fifties Alliance, East 72nd Street Neighborhood Association, to name a few. All gathered to demand common sense zoning reform now, not six months from now, in order to stop the routine DOB approval of egregiously non-compliant buildings. FRIENDS will release updates as information regarding 180 East 88th Street is made public. The next hearing at the BSA is tentatively set for Tuesday, October 30, 2018. “UES tower dispute heads to appeal.” by Michael Garofolo, Our Town, July 17, 2018. “Manhattan elected officials call on the city to crack down on zoning workarounds.” by Sam Raskin, Politico, July 16, 2018. “Electeds, advocates seek to close zoning loopholes.” by Gregg McQueen, Manhattan Times, July 18, 2018.